Each delay mode in the DD-500 has been carefully crafted for a unique sonic personality and rich tones at every setting, thanks to cutting-edge BOSS DSP running at 32-bit/96 kHz. While the delay effects are high-end digital, the pedal features a 100-percent analog dry signal path, so you can be assured that your straight sound always remains pure. You even have your choice of buffered-bypass or true-bypass operation, giving you flexibility for any type of setup. Front panel of the DD-500 Digital Delay. The DD-500 provides a sophisticated range of sound-making capabilities in a compact design that fits easily on your pedalboard. It runs on a standard BOSS PSA-series AC adapter, but can alternately be powered by four AA batteries for standalone use and grab-and-go gigs. With the DD-500, you have the tools to dial in any delay sound you can dream up. 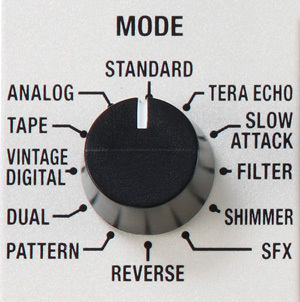 The 12 unique delay types include basic echo, warm analog delays (BOSS DM-2 style), classic tape delays (such as the RE-201 Space Echo), pattern-based effects, and complex modern delay lines that employ pitch shifting, filtering, and other unique processing. 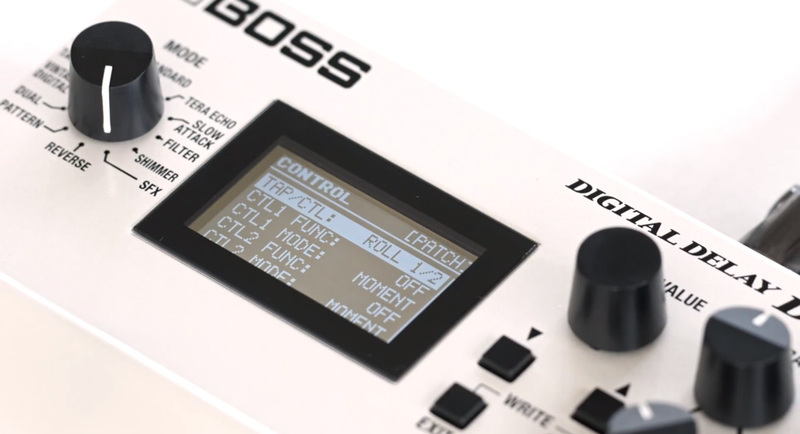 The pedal’s Vintage Digital mode provides BOSS’ first emulations of some sought-after classics from the past. Included are sonic replicas of the legendary SDE-2000 and SDE-3000 rack units from Roland, which were regularly found in rack systems used by high-end studio and touring players in the 1980s. The sound of the BOSS DD-2, the first stompbox digital delay, is onboard as well, which is still highly regarded for its gritty, early-digital-era tone. 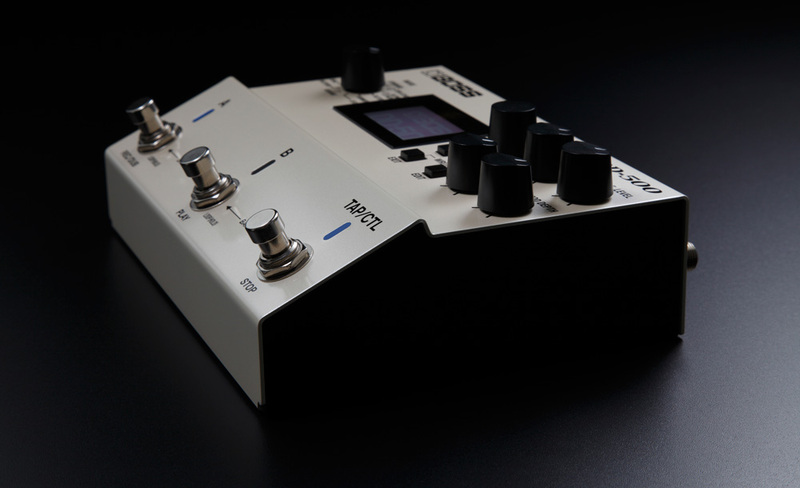 The DD-500 also includes a Tera Echo type, which is based on the TE-2 pedal released in 2013. Only available from BOSS, this effect combines delay, filtering, and modulation in a unique way to create a very cool sound with lots of spaciousness and movement. With the DD-500’s quick-access controls, it’s easy to dial up great sounds immediately. Just select a delay type with the Mode knob, and season to taste with the dedicated panel knobs. If you’d like to dig in and tweak things even further, the DD-500 lets you do that for days. Under the hood, each delay type includes a semi-parametric four-band EQ, modulation, ducking, and many other parameters, allowing you to dive deep and refine tones with unmatched precision. After you’ve created the perfect sound, you can save it to one of the 297 onboard patch memories for instant recall at any time. From the factory, the patches come loaded with a diverse selection of ready-to-go sounds, which you can play right away or use as starting points for your own sounds. Rear panel of the DD-500 Digital Delay. While some other sophisticated delay pedals offer lots of sounds and editable parameters, they often have limited user interfaces that make it difficult to access them all. But that’s not the case with the DD-500—the large, integrated LCD fully supports the pedal’s immense capabilities, providing easy visibility for detailed parameter adjustments, patch naming, and system settings. In addition, the large display gives you a clear view of the delay time, current patch name, and more on one screen, a vital feature for easy usability on stage. The DD-500 also includes a USB port, allowing you to connect to your computer for patch backup and MIDI control with the music software of your choice. The DD-500’s large display provides easy visibility for performing and editing. Thanks to its freely assignable controls, the DD-500 offers unmatched creative expression and performance flexibility. With the default configuration, the A, B, and TAP/CTL switches provide control for two patches, bypass, bank selection, tap tempo, and more. This setup offers lots of instant-access control, and may be all you ever need. However, the switches can be customized to operate in alternate ways, giving you versatility to play any way you like. For example, you can configure the switches for access to three different delay patches, making them all available on one level without having to scroll through banks. There’s even a mode that lets you use two different patches simultaneously, great for creating complex layered tones. The DD-500’s switches can be reassigned to control alternate functions. You’re also able to assign the TAP/CTL switch to various functions like Warp or Twist, opening up a wide range of dramatic real-time effects. 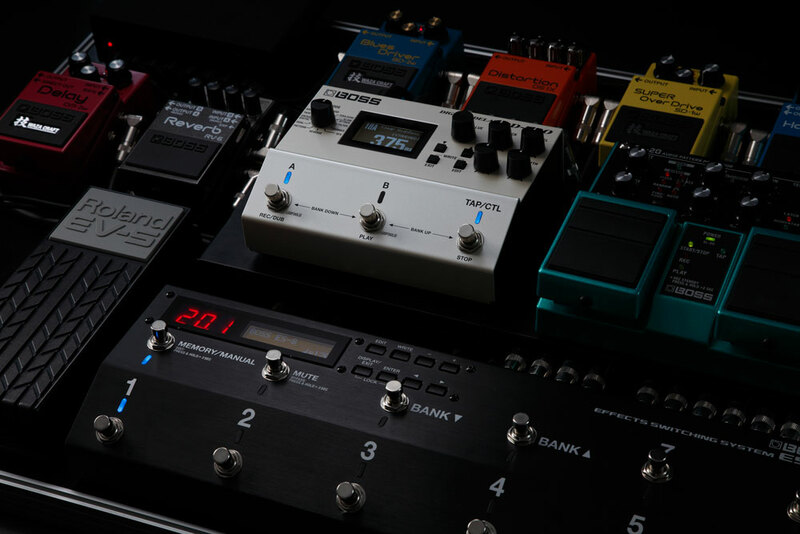 Even more parameters can be manipulated via an optional expression pedal or external switches, and MIDI I/O opens up many additional control options with advanced setups, such as those that incorporate the powerful BOSS ES-8 Effects Switching System. The DD-500 Digital Delay on a pedalboard with the ES-8 Effects Switching System. Along with its other impressive capabilities, the DD-500 includes an independent Phrase Loop function with up to 60 seconds of stereo recording time (120 seconds in mono). 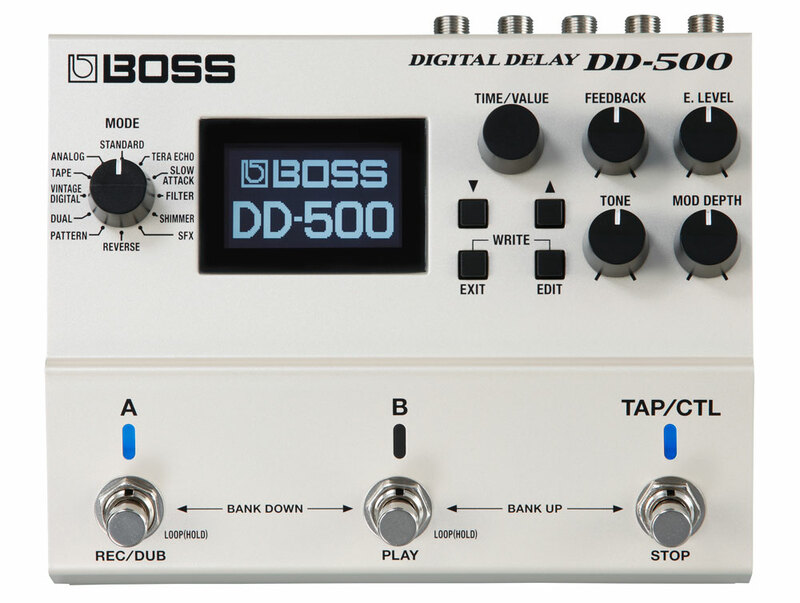 Visit the DD-500 product page to learn more about this amazing delay pedal.